This was mentioned recently by Patrick St Denis on his well known blog, Pat’s Fantasy Hotlist. He recommended it, so when I saw a secondhand copy here in Seoul in What the Book?, I bought it. I already knew that Pat, for some reason, likes Dan Brown – and that should have been enough to prevent me wasting my money. I try to finish any book I start, but sometimes a novel is just too awful. William Horwood’s Duncton Wood was the last one; others include The Crystal Shard by R A Salvatore and the first of Robin Hobb’s Liveship books. 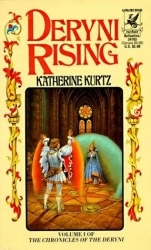 Deryni Rising is actually quite an old fantasy novel – the first edition dates from 1970, which puts it between the growth of popularity of The Lord of the Rings in the sixties and the blooming of contemporary fantasy in the late seventies that wa spearheaded by Terry Brooks’s Shannara series and Stephen R Donaldson’s Thomas Covenant books. This age is perhaps a mitigating factor in the novel’s awfulness. Or perhaps not. TLotR is not really noted for the high literary standard of its writing, either. Brion Haldane, King of Gwynedd, Prince of Meara, Lord of the Purple March … was not a big man, though regal bearing and a catlike grace had convinced many a would-be adversary that he was. But his enemies rarely had time to notice this technicality. … When he spoke, whether with the crackle of authority or the lower tones of persuasion, men listened and obeyed. The novel was shaping up to be pretty basic, cliché, utterly non-challenging stuff; young adult literature in the worst sense. It reminded me of David Eddings’s Pawn of Prophecy, another lame fantasy work I read back in the days when I had more time to read bad novels. Oh, well; you live and learn.